Well, the doors are officially open at the VCU Basketball Development Center. The teams have been practicing inside the facility for a week or two, but we officially cut the ribbon Monday. Other than a few bells and whistles, everything is up and running, and man, it is truly impressive. It can’t help but elevate both VCU’s men’s and women’s basketball programs. 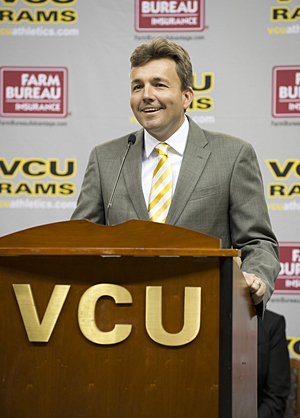 RICHMOND, Va. – After weeks of speculation and soft, dodgy denials, VCU President Dr. Michael Rao saddled up to the podium Tuesday at the Verizon Wireless Arena and announced the Rams would be moving to the Atlantic 10, effective July 1. He may have also lit the fuse on the dynamite at Colonial Athletic Association headquarters, but that’s a discussion for another time. What we should talk about is why this move is good for VCU, as many believe it is, myself included (obvious institutional bias aside). First, let’s be frank about this. Men’s basketball is the catalyst for this. Yes, the logistics of other programs are important to this discussion, but without men’s hoops, this would have been just another Tuesday in May. After a run of five NCAA Tournament bids, two NIT appearances, a Final Four, four conference titles and seven NCAA wins (and four close losses) since the 2004-05 season, VCU felt it had reached a ceiling with the CAA. In an effort to keep the program on an upward trajectory, Rao, VCU Interim Athletic Director Dave Benedict and the Board of Visitors jumped at the A10 opportunity.